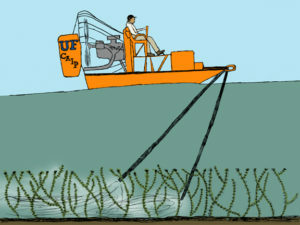 Aquatic pesticide applicator in St. Cloud, MN Lakes Area - Limnopro Aquatic Science, Inc.
Limnopro is licensed and certified in Minnesota to apply chemicals to nuisance aquatic plants, algae, and mosquitoes. We have experience treating pioneer infestations of invasive plants and maintenance control of nuisance weeds and algae either offshore working with lake associations or nearshore on an individual property basis. We are also licensed to do mosquito control and mechanical removal of aquatic plant mass.